Yesterday, a reader of this blog located me at my hotel up after reading I was in Cupertino. Turns out he is a fellow foodie and an Indian history buff, in addition to being the founder-President of a rather interesting startup company! As you can imagine, I was only too happy to accept his dinner invitation. Over Thai food, he told me about his research tracing descendants of Indian royal families (he recently located two of Tipu Sultan's direct descendants who are now rickshaw pullers in Kolkata!). He also knows William Dalrymple personally since both of them share a love of Indian history. The new Krungthai restaurant in San Jose is within walking distance of the original Krungthai. This Zagat rated restaurant is very popular with the locals. Since we hadn't made reservations in advance we had to wait for about 15 minutes before they escorted us to our table. 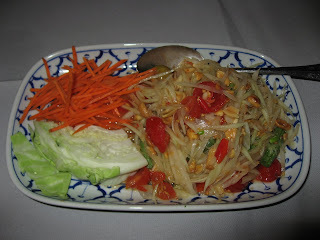 We began with Som Tum, an awesome papaya salad that I will recommend to everyone! This salad captures the flavor of Thailand with fine, shredded green papaya tossed with dry shrimps, cherry tomatoes, ground peanuts, hot chilly with lime and garlic, and served with sliced fresh cabbage. We ordered the salad without the shrimps and medium spicy, which turned out to be a good thing since the level of spiciness was still very good! 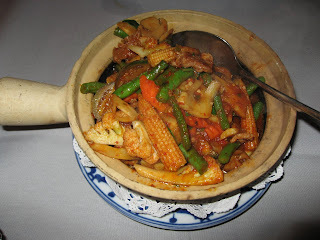 We followed this with Kwoey Tiew Pad Khee Mao or Drunken Noodles. A fire-eater's favorite, this dish consists of flat rice noodles stir fried with fresh chili & minced garlic, tomatoes, basil leaves and minced chicken, and seasoned with dark soy sauce. Another excellent choice if you like spicy food. And finally we chose the Gaeng Pha or Jungle Curry with steamed rice. Simmered in red chili paste with thai eggplant, green beans, sliced bamboo shoots, carrots, sliced mushrooms, baby corn, cauliflower, bell pepper, sweet basil, this curry does not use coconut milk. Very nice and different from the usual Thai curries. We also ordered a bottle of Robert Mondavi, 2005 Merlot which went rather well with the spicy food. After that dinner, we didn't have space left for desserts. A great evening. Thanks, BJ! 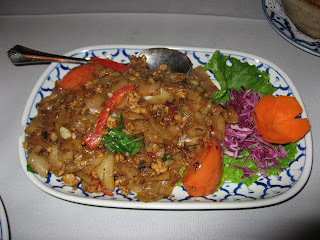 The New Krungthai Restaurant is located at 580 North Winchester Blvd., San Jose, CA 95128. Ph: (408) 248-3425. I remember having some excellent version of the same dishes in an outlet of Thai Express in Singapore. They did a very good job of it! There was a drink as well which was very close to our Kokum Sharbat. @vishal: Singapore is great for street-food in Asia. And their foodcourts are a wonderful way to sample multiple cuisines quickly.